Since Windows Vista, Windows OS (including Windows 7, Windows 8, Windows 8.1 and Windows 10) comes with a hidden context-sensitive menu (also known as right click menu or shortcut menu) that contains Copy as Path menu item or command. Copy as Path, which appears as menu item both for files and folder right click menu, as the name implied, will copy or grab the full path or shortcut to the file or the folder with just one button press and one click. Copy as Path is useful when user want to know the full path or actual location of a file or folder located deep inside a tree of directories or network file share, but want to avoid the hassle to traverse or navigate the path, or avoid having to manually copy and paste from address bar and type the file name. 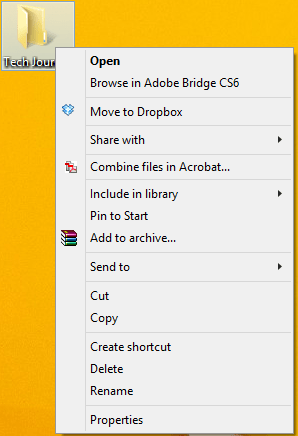 To use Copy as Path, first user need to reveal the hidden context menu (right click menu) items. To display the hidden pop-up context menu items, simply holding down the Shift key, then right click on the file or folder. You will see the Copy as Path now appears as menu item available for selection. 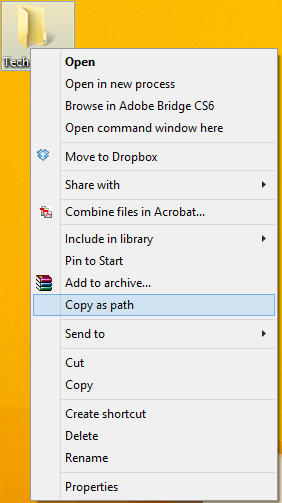 Once you click on Copy as Path, you can paste the full path to the file or folder in your destination application. Check out above figures for right click contextual menu without and with hidden menu items (appear only when press Shift key while right clicking).